Everybody want’s their business to be listed on Google, it’s the best way to get noticed and promote your business online. Unfortunately, there are no shortcuts or a faster way to make your business rise and shine on google local listings, that means local businesses must rely on good local SEO for greater online visibility. Now, the question arises, how to improve your local search ranking on search engines? Local searches are always competitive and google made it sure by some changes that makes it harder than ever to stay visible (e.g., the mobile 3-packs now featuring paid ads that push down organic results). 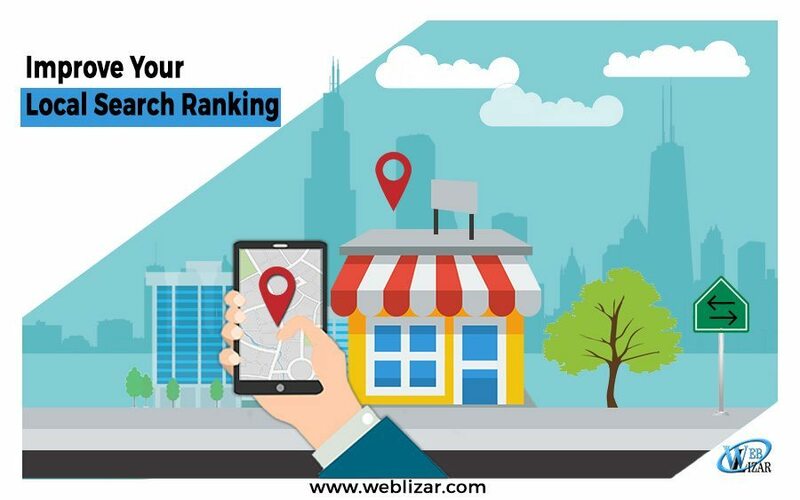 After making a few changes for better improvement for your local SEO, you will see palpable results on your organic search rankings. Every good SEO campaign starts with keyword research, which – for most people – means turning to Google’s free tool, Keyword Planner. If you need generic keyword ideas, this tool is a gem. However, ever since Google killed its location search filter back in December 2015, simulating local search results from a different city has become a lot more complicated. You can’t just add a location to your keyword because that creates an entirely different SERP (e.g. searching for “burger joints” from Mumbai and “burger joints Mumbai” from Delhi will return entirely different results). Add the “near” parameter to their URL: After typing in a query they modify the URL by adding “&near=cityname.” This draws results as if you’d searched from near that location. Use the “uule” parameter: You can append each search with a base64 encoded form of the “Canonical Name” of a location called the “uule” parameter. Use software to target specific GPS coordinates: Letting an algorithm geo target your keywords via GPS coordinates is by far the easiest and most accurate solution. Once you’ve finalized your keywords, it’s time to put your research to the best use. Create content that targets your keywords with low competition, and don’t forget to add them to your anchor text and HTML tags. According to a survey, link signals account for 29 percent of ranking factors, and that’s a huge amount to make link signals considerable. That means link building should be one of your top local SEO priorities. Unfortunately, building organic links takes time. You need a repertoire of valuable content that influencers want to click on before you can truly take advantage of link building opportunities. Look for opportunities to collaborate with influencers and find other ways to build your brand reputation online. One of the best ways to score some quick, high-quality backlinks is to help site owners find and fix broken links in their content. Simply scour high-ranking posts in your niche for broken links, let the site owner know if you find any, and then offer up your website as a substitute. Forty-three percent of SEOs interviewed used broken link building within the past 12 months, and it proved to be one of the easiest and most efficient ways to new backlinks. Figure out which sites link to more than one of your competitors, but don’t link to you. Determine the relative domain authority of each of these sites (your competitor analysis tool should give you this information). Make a list of the most influential and relevant domains. Perform link outreach to the domains on your list. It’s important that your NAP (name, address, and phone number) remains consistent on every website it’s listed on. Use rank tracking software to monitor your citations and if you ever find NAP inconsistencies, contact the site owners or directories in question and ask them to correct the mistake. According to a study, on-page signals including NAP are the second to third most important ranking signals for both local pack rankings and localized organic rankings. Claim your listing (here’s how). Ensure your business details are up-to-date. Common mistakes include wrong opening hours, erroneous opening hours, and incorrect category listings. Upload high-quality business images (or refresh existing images if they’re more than a year old). Once your Google My Business page is set up, the best way to keep optimizing is to win customer reviews and build citations for local listings. Social proof is among the most powerful content at your disposal. Reviews, testimonials, and case studies are both powerful ranking signal (7-13 percent) and persuasive pieces of copy that often decide whether a customer hires you or one of your competitors. Offer link building opportunities: Your customers want to build links just as badly as you do, and many will leap at the opportunity to be featured in a case study if it means free publicity. Don’t have time to build a case study yourself? Websites like Case Study Buddy can help. Encourage customers to leave reviews: Hand out leaflets, print out a QR code on your receipts or business cards, and ask customers in person when they’re paying the bill. Ask for reviews: Yes, it is all about asking. You won’t win reviews from all of your customers, but all you need is a tap on your back of positive feedback on the platforms your customers visit frequently and you’ll soon build up a solid reputation. You’ll need to use structured data markup if you want your business to appear in the local Knowledge Graph panel on the right side of Google’s SERPs. It also lets you provide visitors with a rich snippet that gives them information like your NAP and positive reviews. Unfortunately, you’ll have to use different markups for different platforms. For example, you should use Schema for Google search results, but you’ll need Open Graph for social media sites like Facebook, LinkedIn, and Google+. The hack? There’s software available that will let you manage all your markups from one central hub. #8 Video And Images Are Important! While most businesses measure metrics like visitors and CTR, surprisingly few realize that quality rank tracking software can also check your video and image rankings. Check your rank tracking tool for an option to enable universal search results, and your software should gather results from search engines like YouTube as well as Google, Bing, and other search engines. Optimizing images is often as simple as compressing your images to reduce their file size. Make sure your images are properly formatted (usually .jpg or .png) and then compressed with a tool that preserves image quality. To improve your videos, optimize your titles and metadata to be more clickable and include at least one keyword, creating unique thumbnails, and transcribe your video text to help YouTube’s indexing. Hope these quick tips will help you rank better in local SERP. Also, to keep the interest going on, go through The Ultimate WordPress Web Designer’s SEO Checklist and Factors For Mobile SEO Ranking 2017.